I just finished watching the last few rides of the Brentina Cup online, and I am so impressed with these young women and men! I can't help but feel a little jealous, though, wishing I had started riding dressage when I was a kid instead of in my thirties. There are plenty of days when I think it's just too much to juggle the horses with everything else that comes with raising a family, but then I hear my sweet family cheering for me at the horseshow, or I get tackled by Rowdy's hugs, telling me I did a great job (he's 6 and a great judge of dressage tests), or I find Syd's sweet note in my tack trunk that says, "Mommy, I think you deserved the blue ribbon," and I realize not only do I love it, but it is actually great for my kids, too. They are so proud to have a Mom that works hard at something that doesn't come easy, and who still competes in a sport, even if it means a huge effort by all of us to get loaded up and on the road. 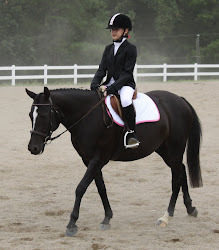 They see me get so excited over a great ride and so frustrated when I don't do well, and I realize how much it helps me relate to them in all that they are trying to learn and accomplish. It reminds me how hard it is to learn something new and stick with it, even on the worst days. We should all be forever students, and while I'll probably never ride like those young riders I watched today, it really is about the process of trying to just be better than you were the day before. Luckily Barney and Caruso don't mind when family duty calls me away from dressage training, so we'll just keep doing the best we can, horseshow when it works, and remember that it is supposed to be FUN!